A landing page has the power to attract or repel a customer. It is the first impression of your online presence that customer judges your product for, so you need to have a perfect landing page. 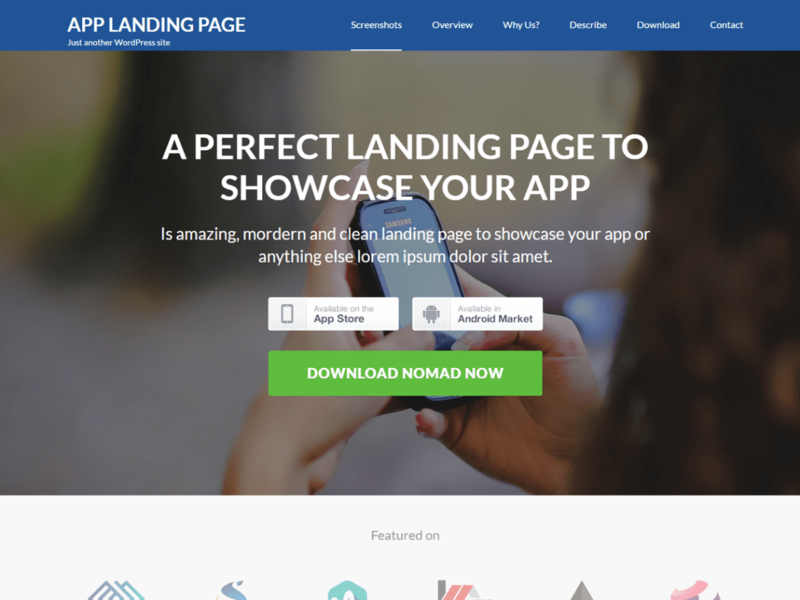 But, what do you need to create a perfect landing page? Well, here’s a detailed guide on how to create a perfect landing page for your small business if you really like to dig deep. Otherwise, in simple words, a perfect landing is where a customer gets what he is looking for and you get what you are looking for — a customer. 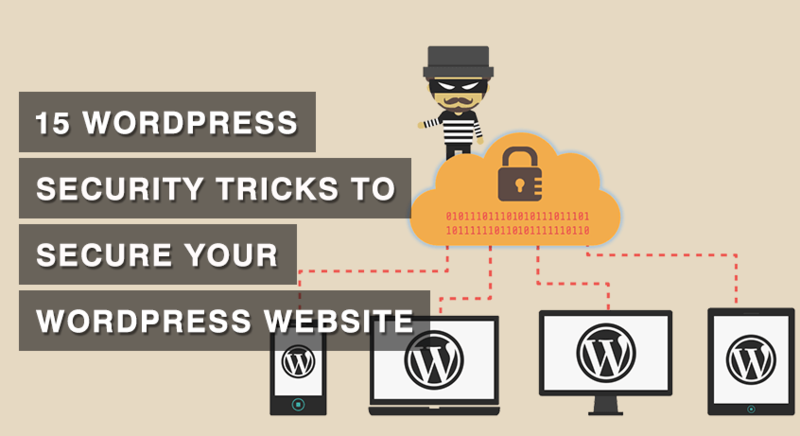 When a customer visits your WordPress website, the landing page should ease your potential customers. They should be able to learn about the product/service that you provide without hassle so that you can turn these potential customers into real customers. The job of a landing page website is to present all the information for the visitors on the first page that they land on. The aim is to provide distraction-free information to help your users to get a proper understanding of your company. This helps in attracting potential customers towards the product or services you offer. So, the landing page of your website should have a clean, professional, and UX optimized design. A confused viewer is a customer that you will never have. So, make sure your website is engaging. 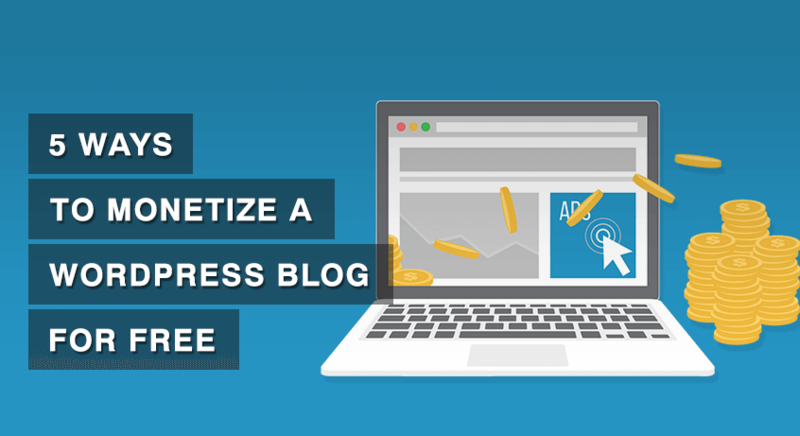 After you have captured the attention of the visitors, you then need to convert them with CTA buttons. So, an appealing, clear, and properly placed Call To Action button is a must for a landing page. But, creating such a lead generating website can be expensive…unless you have decided to use WordPress. You can get all the necessary features of a perfect landing page for free if you can find the appropriate WordPress theme. 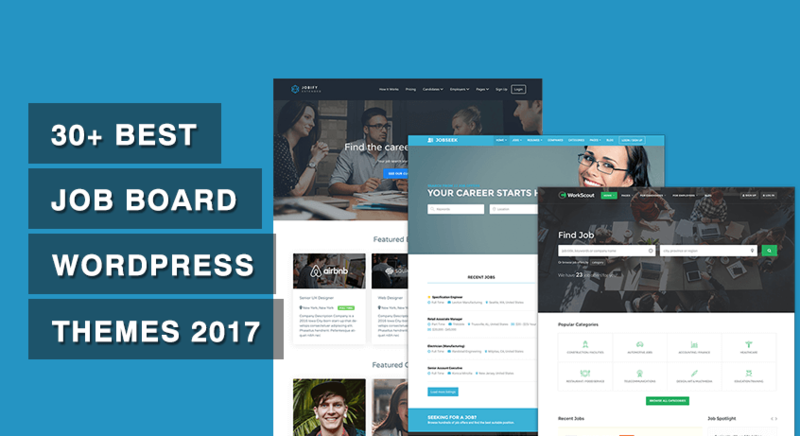 And, to make your task easier, collected with our WordPress expertise, these are the best free landing page WordPress themes of 2017. 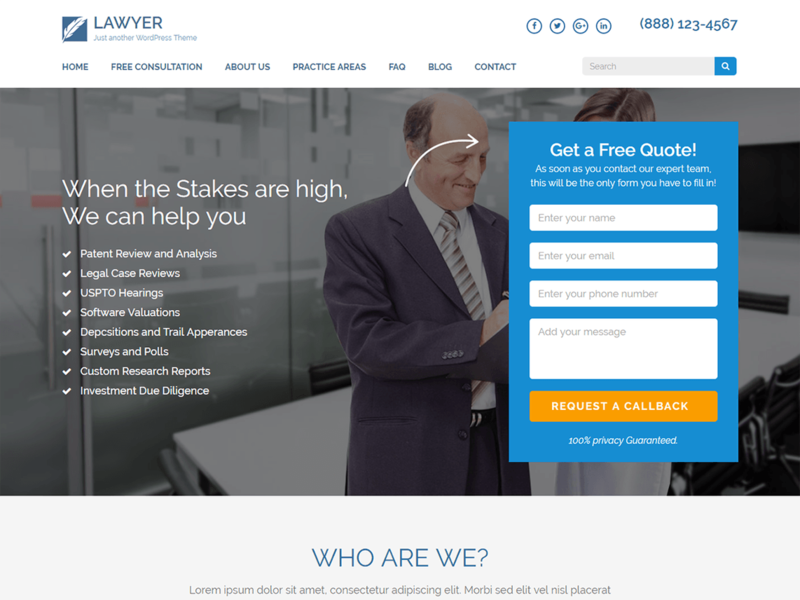 Lawyer Landing Page is an exceptional and professional free landing page WordPress theme. This landing page theme can influence your visitors with a clear and beautiful UX and UI optimized design. The over-the-fold contact form on this free website template is perfect to increase email enquires. The theme is great for businesses that want to create an effective landing page to generate and capture leads. The theme is fully responsive, SEO ready, and Speed Optimized so that you are ahead of the game. 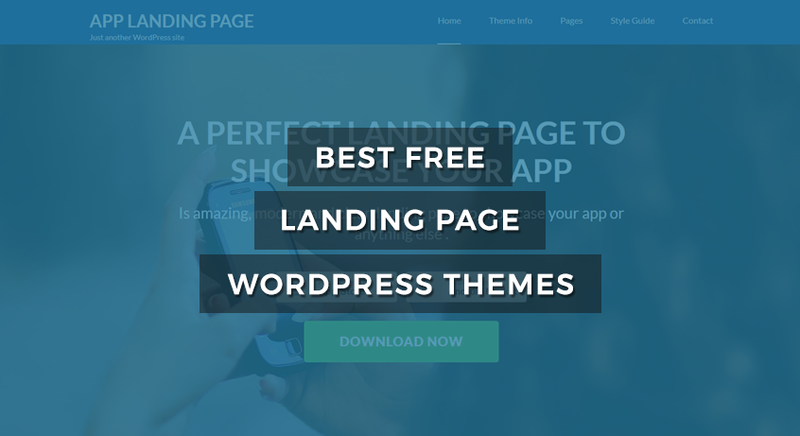 If you are new to web development and want to create and customize your landing page website easily without writing a single line of code, then Lawyer Landing Page is the theme for you. The theme is very easy to use and easily customizable. You will also get free demo content that can be imported with a click, which means you can have your website ready in no time. 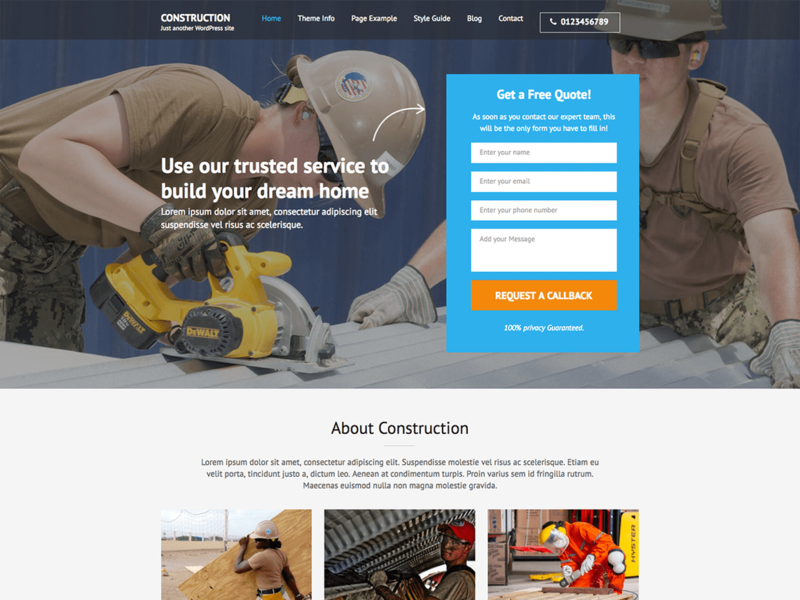 Construction Landing Page is a free WordPress theme for construction company or business. This clean, modern, and responsive WordPress website template is designed with latest and effective UI design to increase user experience. You can place a contact form on the banner section and just above the footer to increase your leads. The theme is perfect for anyone looking to get more signups. Construction Landing Page will help you create a clean and professional landing page website for any niche! You can talk about your history, your services, your projects, your accomplishments, and your clients, display testimonials, and ask users to take some action on a single page. The theme is radically designed so it is easy to use and highly efficient. It is fully responsive, SEO ready, and super fast. Optimized for speed, the Business One Page WordPress Theme is a great way of attracting visitors and making them your loyal customers. 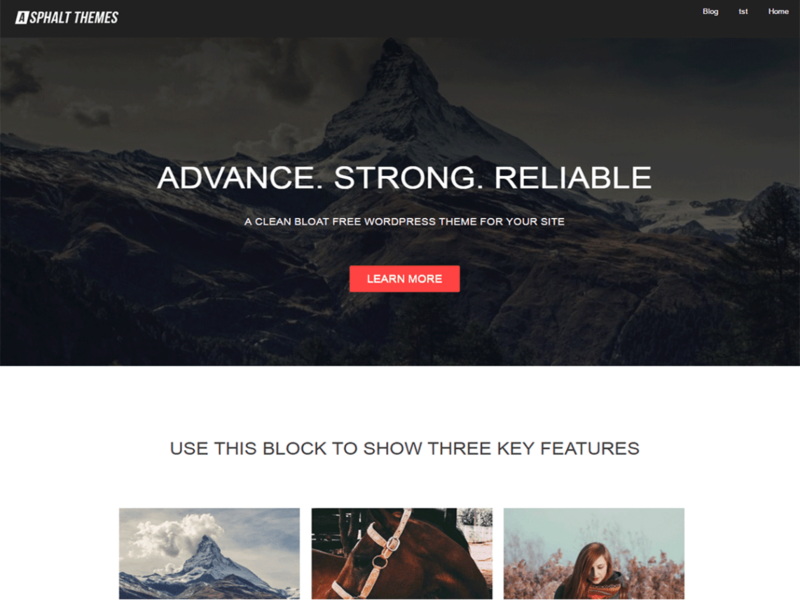 This free WordPress theme is the best solution for creating a perfect landing page. You can display your important information on a sleek and advanced slider on the banner section, talk about your business and services, showcase your portfolio and convert users with CTA buttons. The theme also has a contact form section through which your potential customers can interact with you. What sets Business One page aside is the simple and lightweight design. Your visitors will feel like they are visiting a website of a reputed brand. This theme will help you earn the trust of your customers. Feature-wise, the theme is super fast, fully mobile responsive, and SEO ready so that more customers can find your business. The decent and intuitive design of Education Zone is bound to leave a positive impression on your visitors. This free WordPress theme can be used to create a landing page website that rocks and scissors your competitors. The banner section with a CTA button and the highlight section will help you tell the perfect story to your audience without wasting much of their time. This theme is precise and to the point-- no extra small-talks because customers want straight solutions online. Don’t go with the name because, although primarily designed for schools, Education is powerful enough for creating efficient landing page website. So, if you are a business looking for convection and growth and doesn’t like a crowded design, this it the theme you should be using. 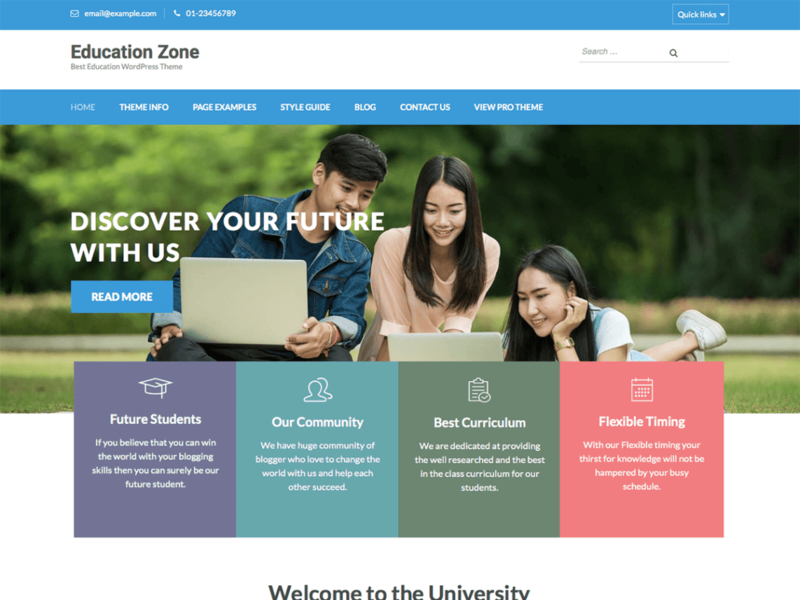 The theme is one of our most popular theme and many businesses are using it so step up the game with Education Zone. 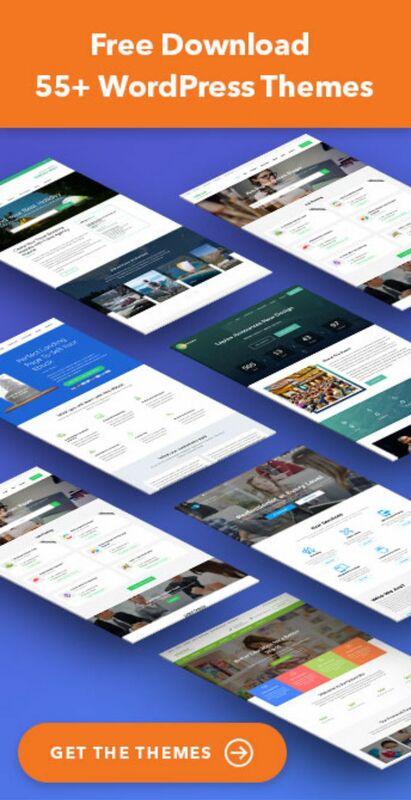 App Landing Page is a stunning free landing page WordPress theme for developers, freelancers, and agencies who want more people to download their app or for small business who want to take their business to the next level. The smooth modern scroll animation gives your visitors a browsing experience that they will never forget. And, with carefully placed CTA button, you can ask users to download your app or perform any action you want them to while enchanting them in a storyline. The theme is also great for businesses that want to create an effective landing page to generate and capture leads. App Landing Page alongside being a truly landing page optimized theme is fully responsive so that you can reach more customers. 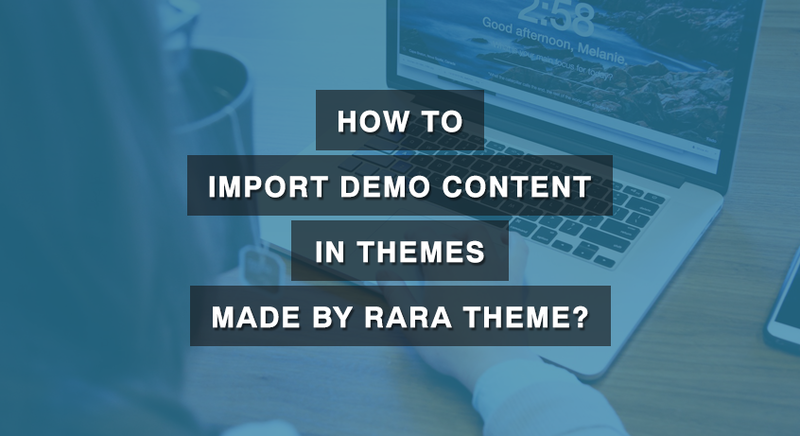 The theme is easy-to-use and you don’t need to have any coding skills to create an awesome website because you can import the demo content of the theme for free and with a click. Book Landing Page is a beautiful and modern free WordPress theme for creating a landing page to sell digital products. Great for authors, novelists, publishers, developers, and designers, the home page of the theme is thoughtfully designed to increase leads and purchase of the product. The theme is easy to use and doesn’t require coding experience. 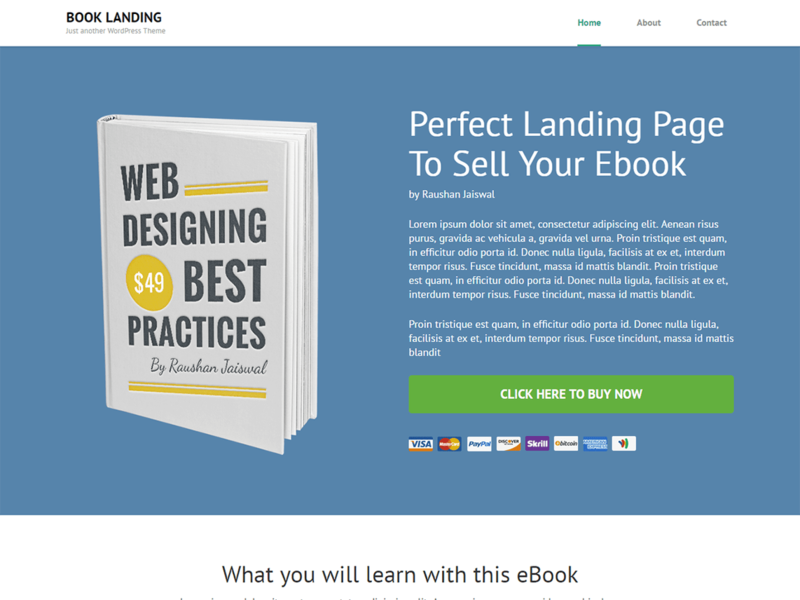 Book Landing Page is very simple and uncluttered. You can also add a video on the home page. If you are selling books, you can even show sample pages of your book. Big CTA button above-the-fold and on the bottom of the website, legible and easy on the eye font and color will help you increase sales. The theme also comes with free one-click demo import feature that will help you get your website ready without hassle. Bhumi Lite is a highly responsive free WordPress theme for landing pages. The theme is based on Bootstrap framework so your website will perfectly adapt to mobile devices, desktops, or any other viewing environment. The theme supports infinity scroll and is WooCommerce ready if you ever want to turn your landing page into an ecommerce website. No matter what kind of business you are into, you should give Bhumi Lite a try. 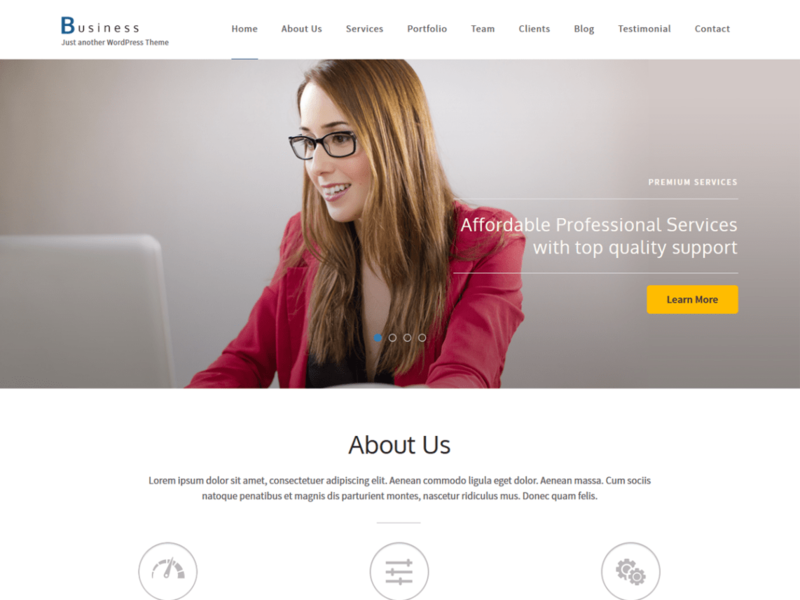 Prolific is a free landing page WordPress theme that is beautifully crafted and is powerful and flexible. It has a clean design and focuses on functionality and ease of use for both the visitor and the webmaster. The modern and optimized design that makes your website visually rich and impressive. 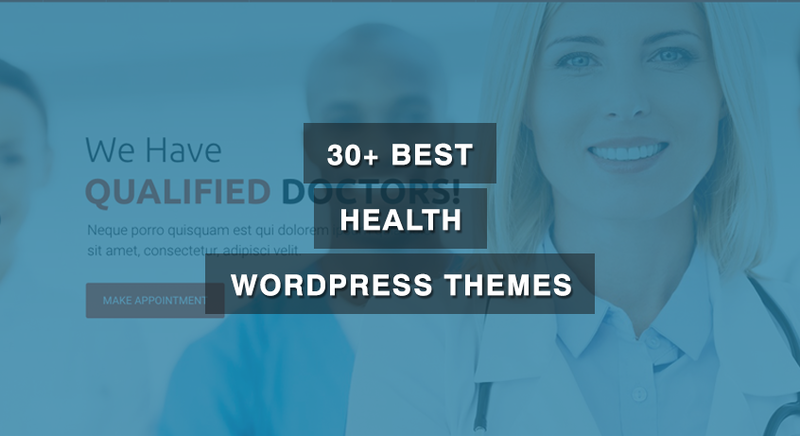 This multipurpose theme has unlimited possibilities for corporate, business, agency, portfolios, showcase, medical, education, travel, restaurant, personal, blogging and type of websites. 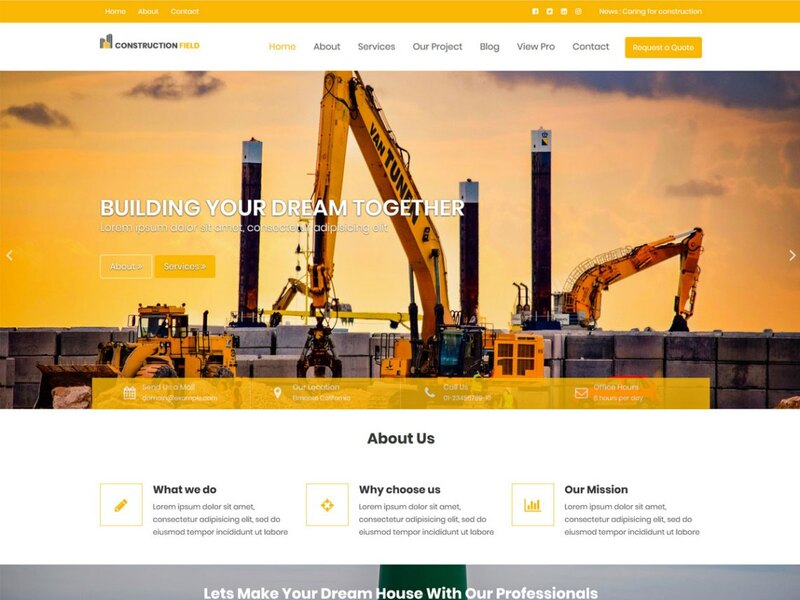 Construction Field is a free business WordPress theme dedicated to construction and building company websites. This theme features multiple customization options and allows you to customize your website as per your desire. The strategically placed Call to Action buttons and contact buttons helps you generate more leads and increase your revenue. This theme is designed to highlight your business and its services that will help you gain more customers. 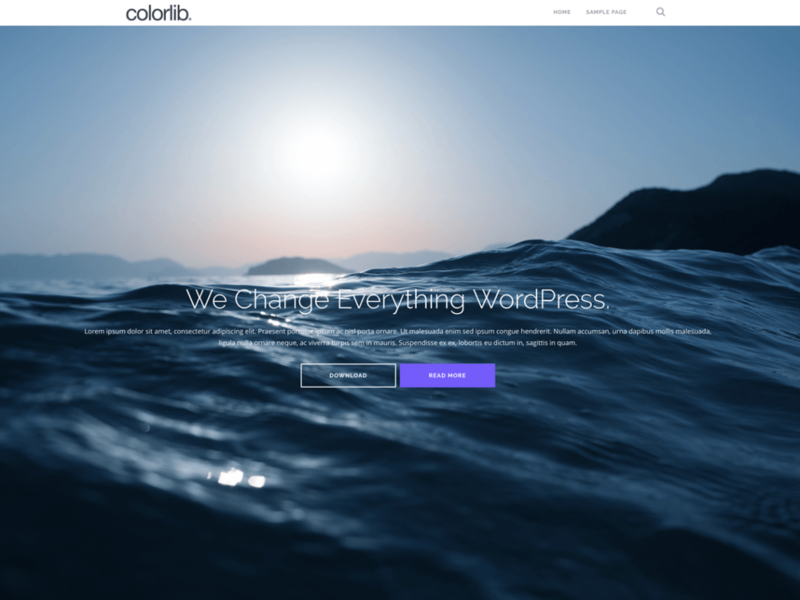 Furthermore, this theme comes preloaded with easy and advanced features that help you curate a fully functional and professional website without writing a single line of code. This theme features advanced customization options which easily allow you to change the look and feel of your website. Some of the highlighted features of Construction Field free WordPress theme are advanced theme options, layout/design control, advanced widgets, about section, services section, blog/news section, gallery portfolio section, social media integration, testimonial/FAQ accordion, etc. 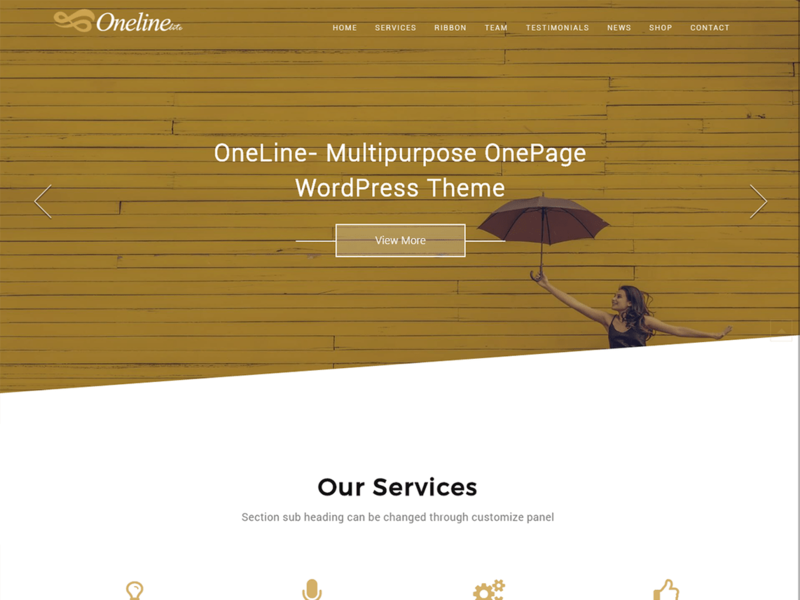 Online Lite is a versatile one-page free landing page WordPress theme that will help you design a beautiful website for any type of niche-- Cross SVG, Onepage, Business, Landing page, E-commerce, Local business, or Personal website. The theme supports drag & drop widget for section content and WooCommerce section to feature your product at home page and use your site as an online store. 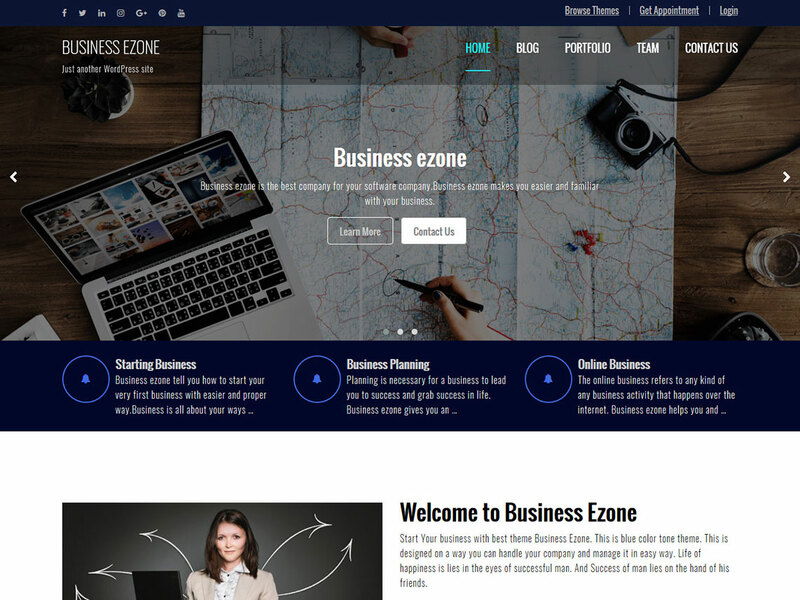 Business Ezone is a free responsive WordPres theme suitable for business and portfolio. It is built on Customizer which allows you to easily customise your website with live previews. 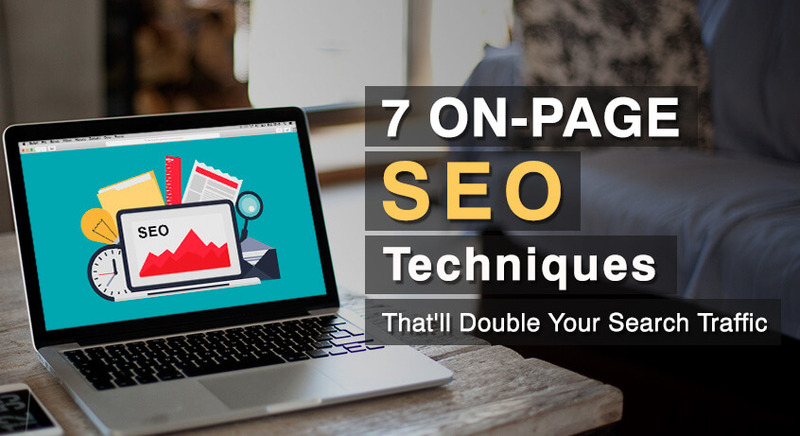 It is also speed and SEO-optimized to help you get better ranking in search result. Business Ezone has typography feature which allows you to change your website font. Other features include custom widgets, social media integration, breadcrumb, author bio and so on. Well suited for any types of business website, Specia helps you easily create a landing page website for free. 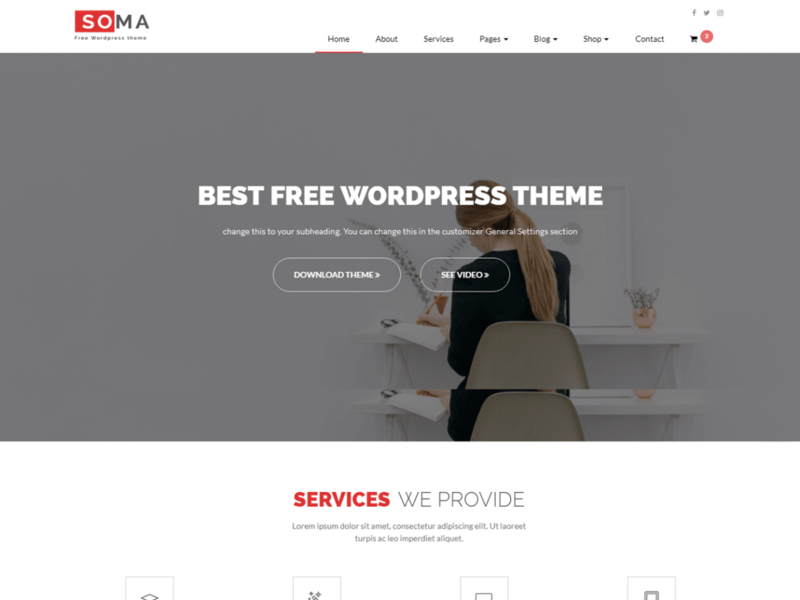 It is a Multipurpose WordPress theme with lots of powerful features that can help you give a professional look to your online presence. The theme is clean and lightweight, making it perfect for small business who wants to grow. 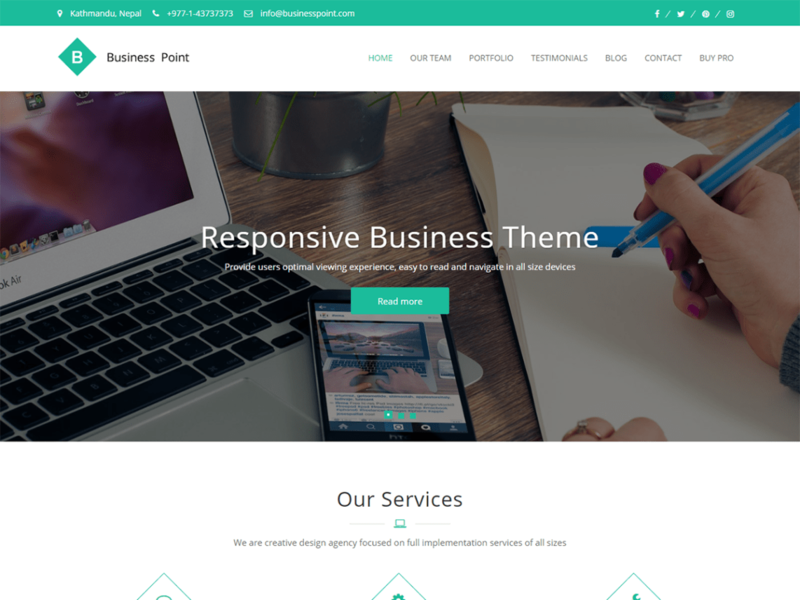 Business Point is a free landing page WordPress theme for displaying your business to the point. The theme has the right amount of features required to create a business website that is modern, professional, and responsive. You can display testimonials, team members, and portfolio using widgets or shortcodes on this theme. The theme has a Call To Action section with a featured image. 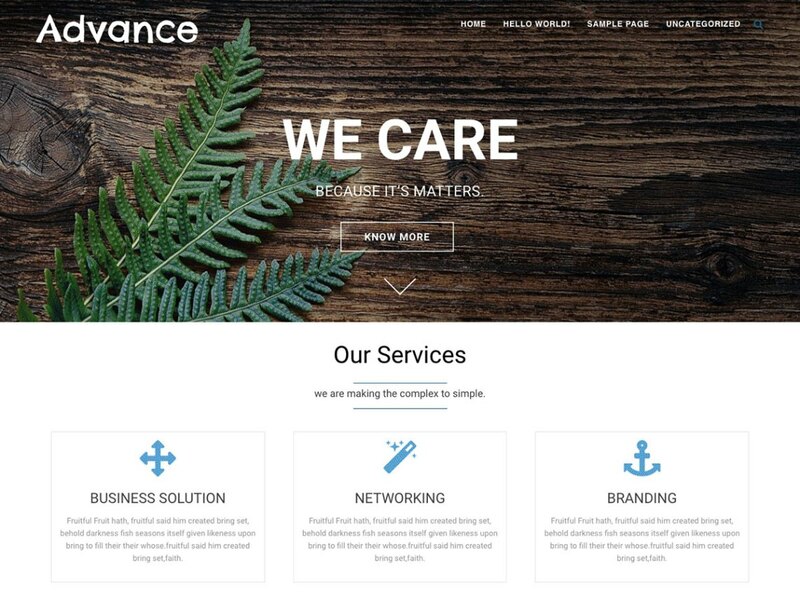 Advance is advanced free WordPress theme. It is more than a theme because it is loaded with features and you can easily customize it to your likings. The theme can be used to create an effective landing page. Advance is responsive and retina ready, which means your website is going to look damn good in every screen size. 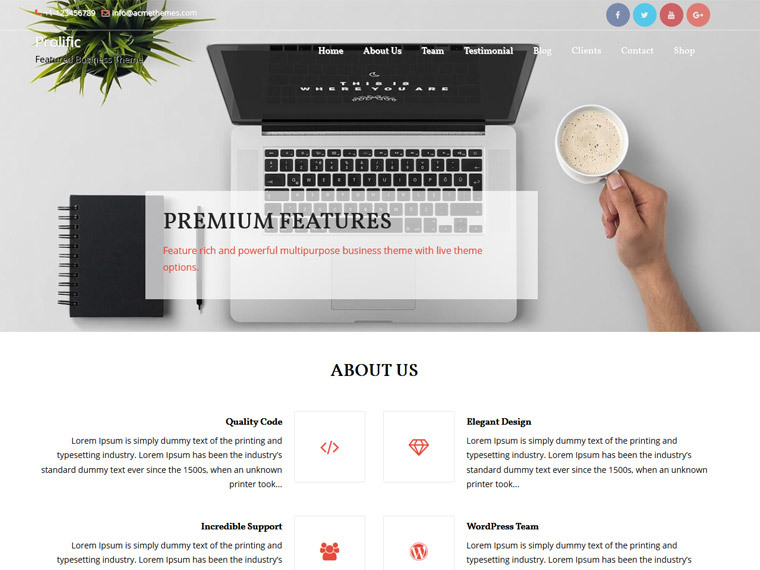 Winsome is a one-page landing page WordPress theme that is suitable for business, corporate, informative, agencies, travel, design, art, personal and any other creative websites. This free theme has scrolling sections in home page, and it is flexible and dynamic enough to use as multi-page or single page site. Impressive design and layout make this theme a good choice for creating a landing page website. Lyrathemes makes cool WordPress themes and Vega is one example of that. 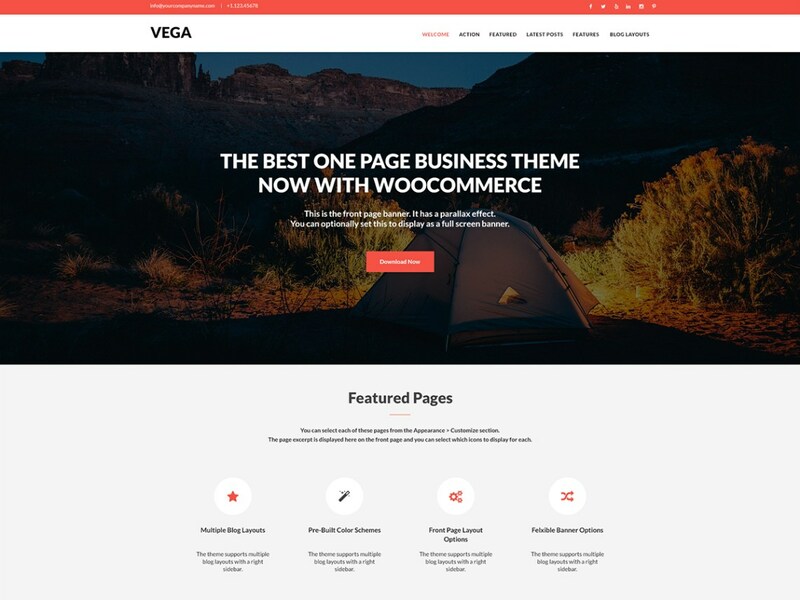 Vega is clean, minimal, and responsive free landing page WordPress theme that can be used to create one-page website also. Impressive modern CSS effects make this theme stunning and engaging. With properly placed CTA buttons and Contact Form on the homepage, Vega is a theme you should definitely try out. 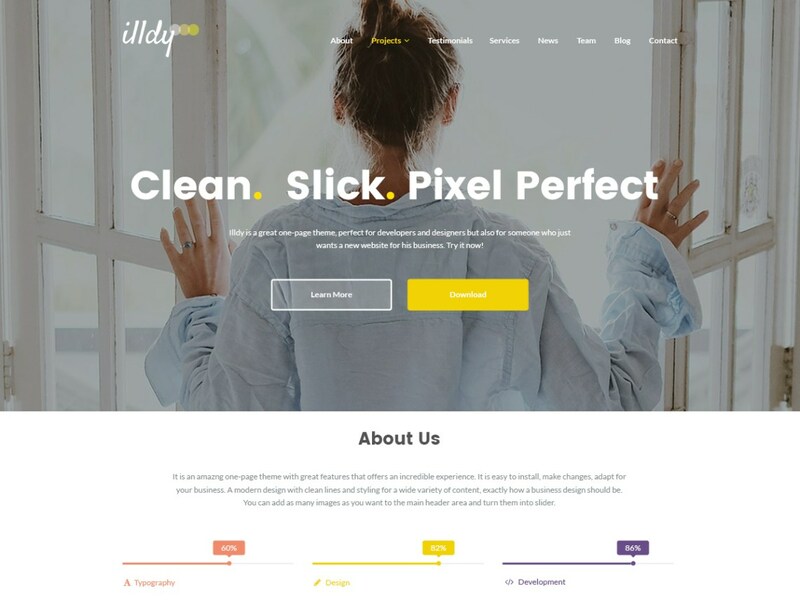 Illdy is a stunning multipurpose WordPress theme built based on Bootstrap frontend framework making it fully responsive and mobile friendly. This theme is well suited for business, landing page, portfolio or any other creative websites. The theme, despite being free, is very flexible. This theme comes with a fullscreen background image and parallax scrolling enabled sections for sleeker user experience. 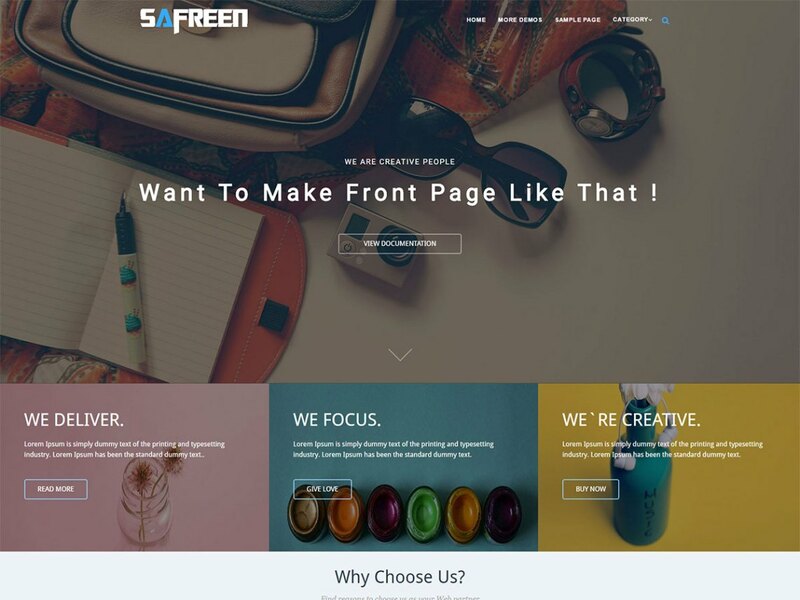 Flat and modern design befriend friendly customization options in Safreen which makes this free landing page WordPress theme a powerful theme for creating a business website without hassle. You can also choose from different pre-built landing pages that are fully responsive. You can tell your story with smooth CSS effects that will keep your visitors engaged. 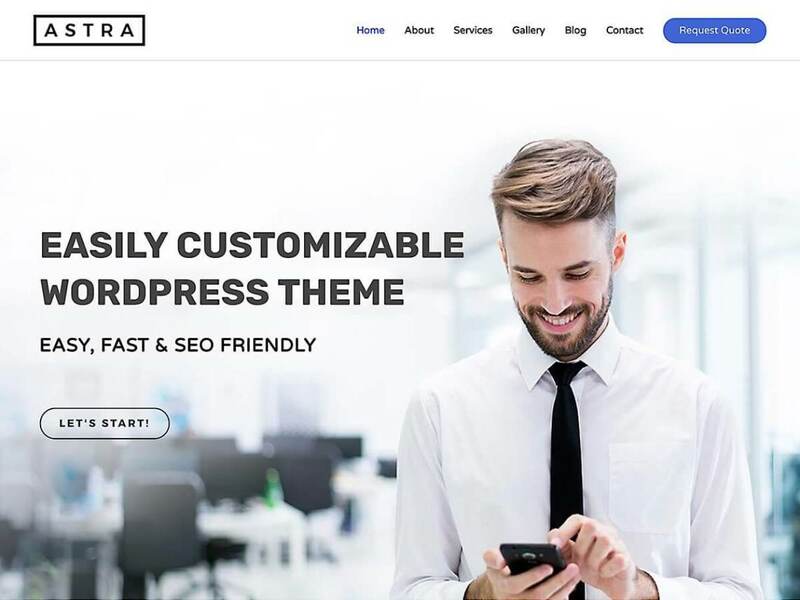 Tar is a lightweight free WordPress theme perfected for creating lead generating landing page website for businesses, creative agencies, or startups. The theme is simple and is not loaded with unnecessary features so that your website loads faster. Tar is also responsive and retina ready. With this free theme, you can easily get started with your website with over 7 pre-built home page layouts. 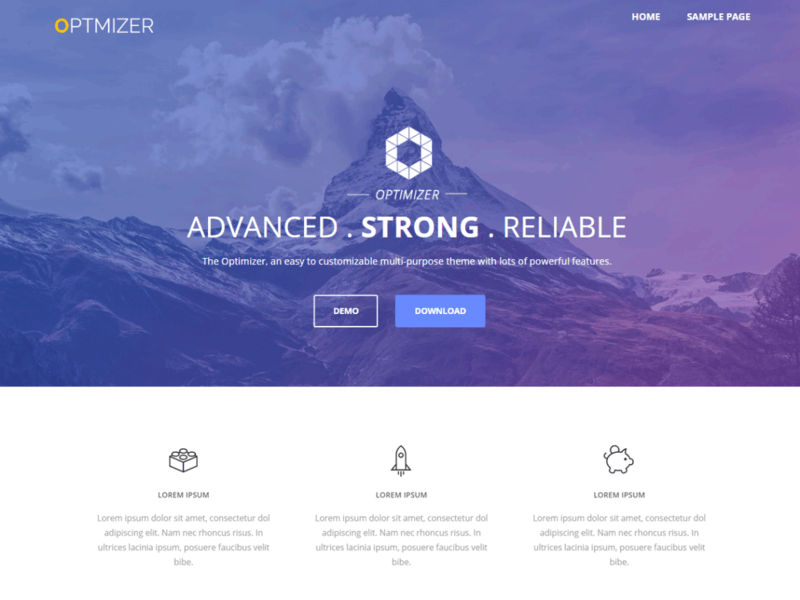 Optimizer is an easy-to-use landing page WordPress theme that is completely free. The is can be easily customized as per your need by just dragging and dropping widgets. The theme comes with full-width and boxed layout. The theme is translation ready and fully compatible with WooCommerce plugin (in case you would want to create an ecommerce store). 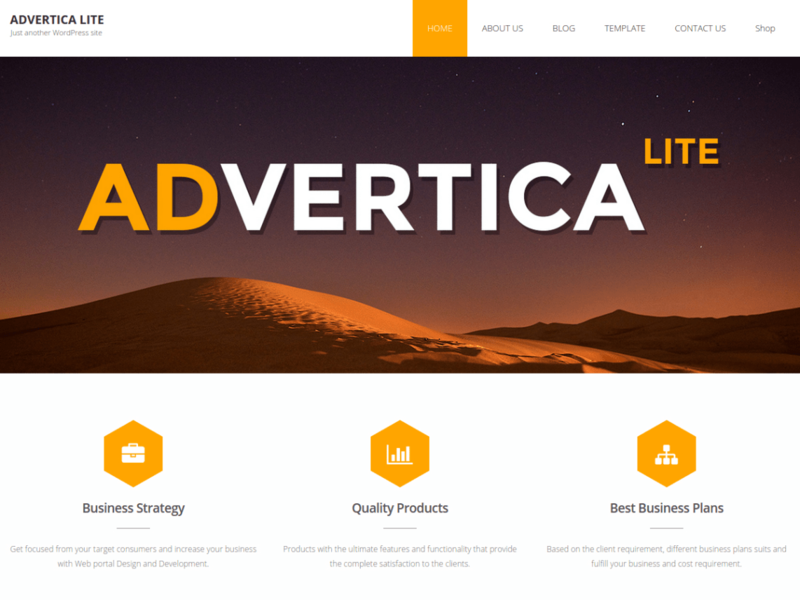 Advertica is a clean, elegant, and SEO optimized free landing page WordPress Theme, enriched with a bag full of features that would give you a massive edge when you are creating a website for your business. The design is based on BootStrap framework so the theme looks great in every kind of device-- big or small. 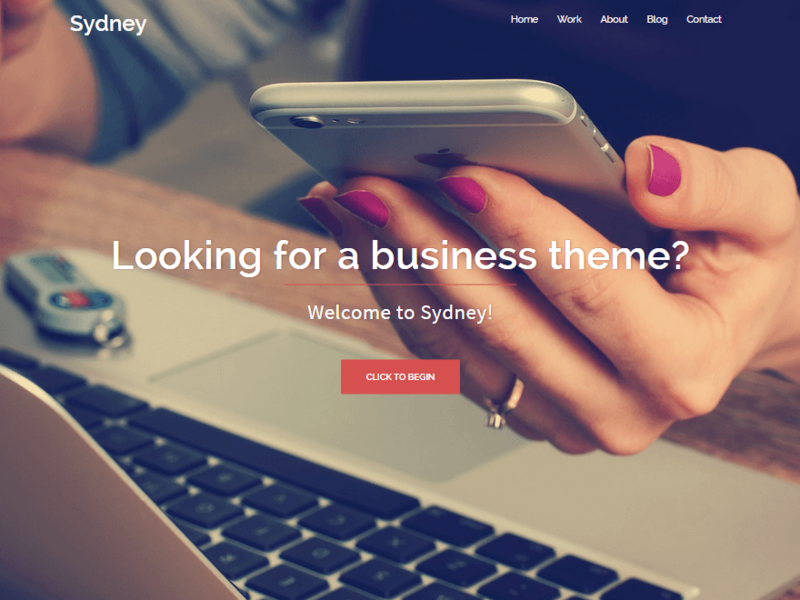 Sydney is a popular and powerful free landing page theme that provides a fast way for companies or freelancers to create an awesome online presence. Sydney brings plenty of customization possibilities like access to all Google Fonts, full color control, layout control, logo upload, full-screen slider, header image, sticky navigation and much more. Also, Sydney provides all the construction blocks you need to rapidly create an engaging front page. Hestia is a mesmerizing multipurpose free landing page WordPress theme for creative agencies. 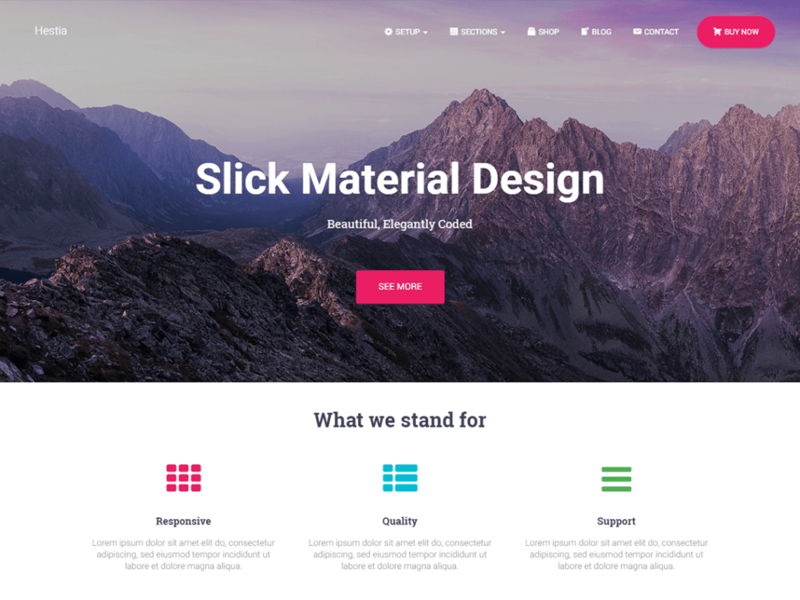 It uses Material design so your website is gonna look sleek, flat, professional, and modern. In one word, Hestia is amazing! You cannot get a better looking theme than Hestia for free. The theme also has a video section and product display section on the homepage. 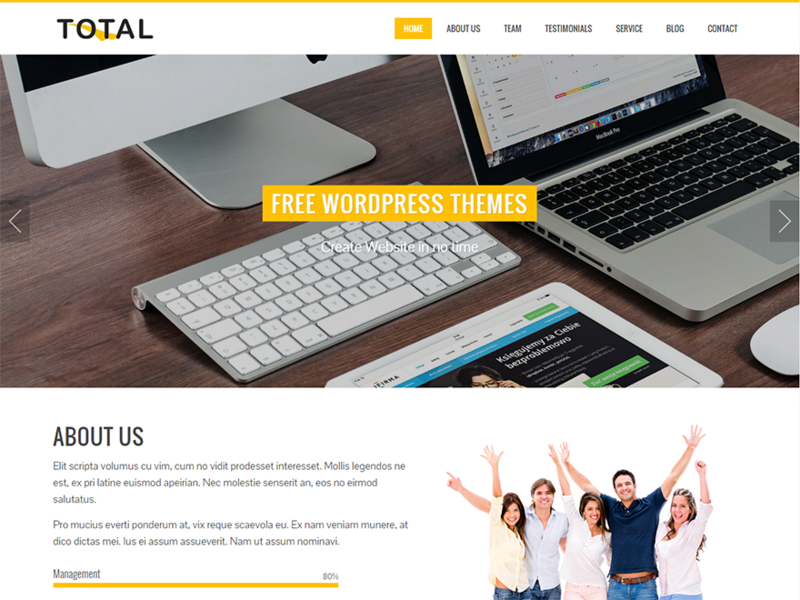 Total is a total package of a dream landing page WordPress theme. The theme is fully customizable and has premium features for a free theme. The theme looks cool, professional, and will certainly engage your potential customers on your website with its vibrant color. You can also create one-page landing page with Total. 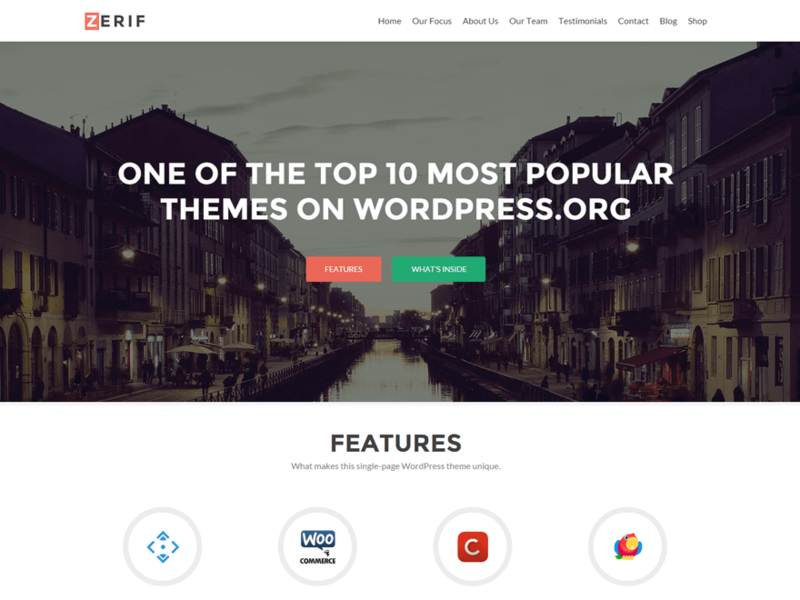 Zerif Lite is a free landing page WordPress theme that will help you show your expertise with UX optimized clean and modern design. The theme has three CTA sections so you are sure to get conversion. The theme looks professional and is built on Bootstrap framework. In short, Zerif Lite is responsive, clean, modern, flat, minimal, and to-the-point landing page theme. 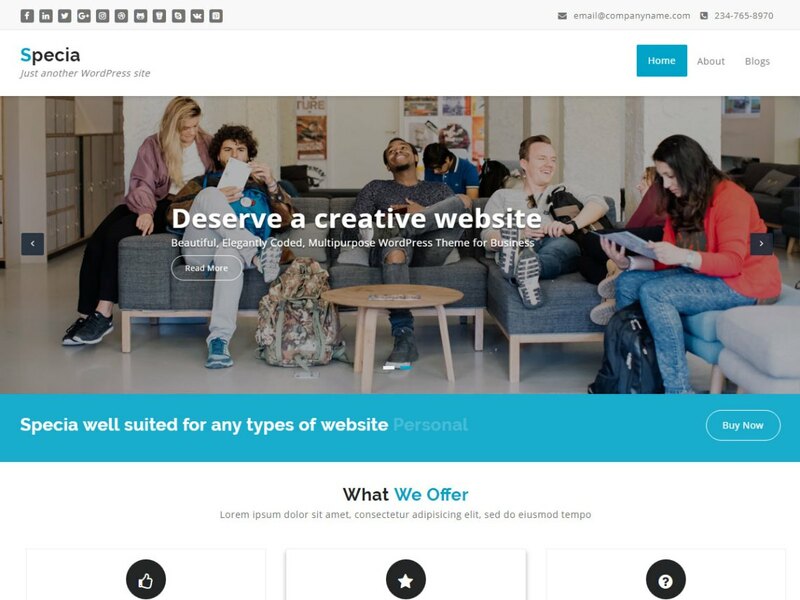 Shapely is a powerful and versatile free landing page WordPress theme with pixel perfect design and outstanding functionality. The theme is loaded with advanced customization option, too good to be true for a free theme. The theme uses widgets to add sections to the home page so you can truly make your website unique. The theme is also compatible with WooCommerce plugin if you want to create an online store. 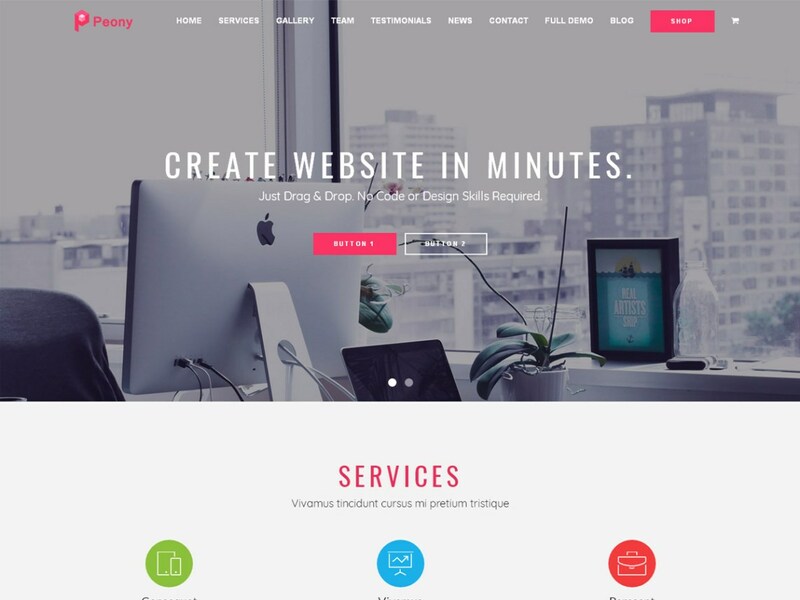 Cool CSS effect and very effective UX design make Peony a great tool if you are looking for a free yet powerful landing page WordPress theme. With the powerful page builder plugin Mageewp Page Layout, which combined with one-click imported templates and various pre-built sections, the theme is perfect for any type of website. 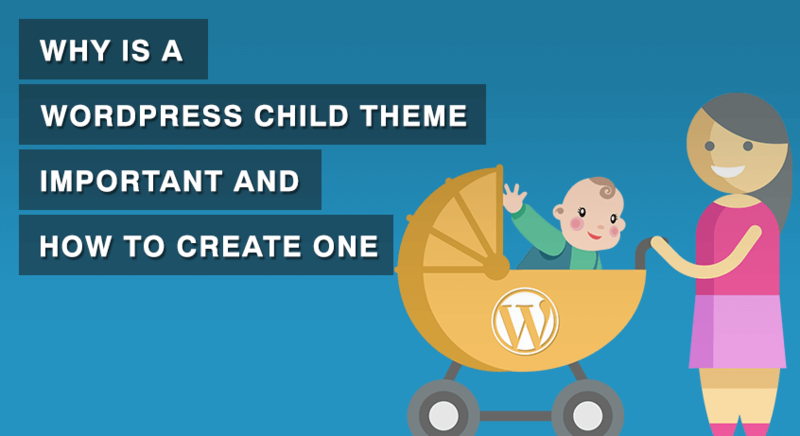 You can also use the theme to create a one-page website. 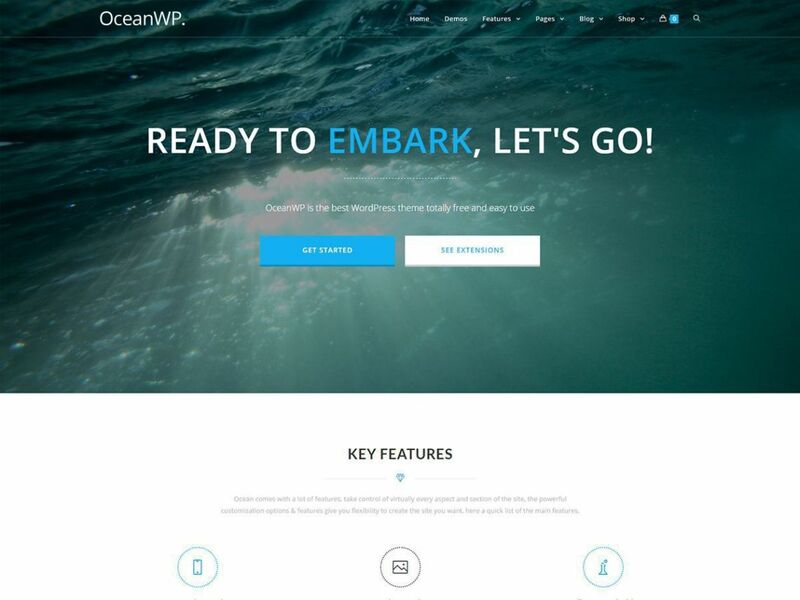 OceanWP is completely free multipurpose WordPress theme suitable for creating awesome responsive landing pages. The theme is SEO ready, translation ready and comes with awesome support. This free theme also comes with one-click demo import so that you can have your website ready in no time. Lightweight and highly customizable, you can create almost any type of business website with a beautiful & professional design. 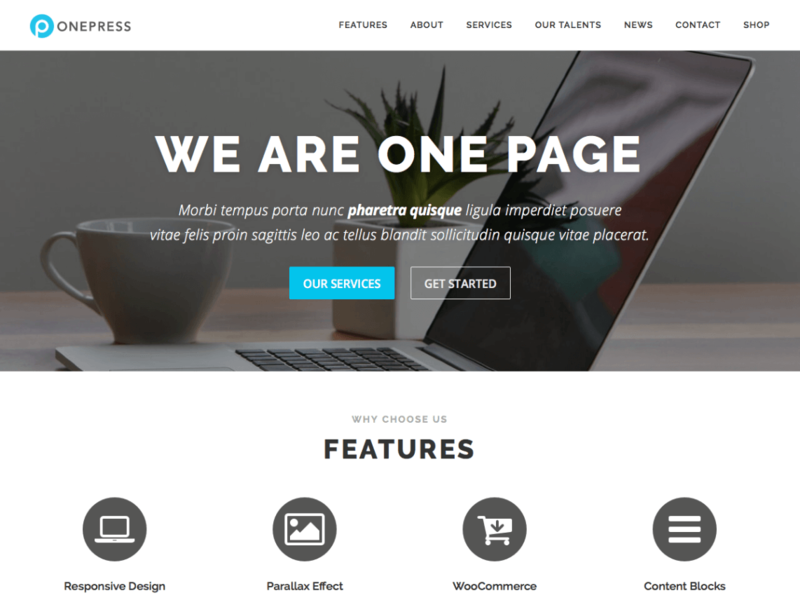 With above-the-fold CTA buttons, video section, and contact form on a single page, OnePress truly is a free landing page WordPress theme designed for lead generation. The theme is also a one-page theme which means your visitors can find all the information they need right in the homepage. OnePress is a perfect solution if you want to showcase your product in a responsive layout. 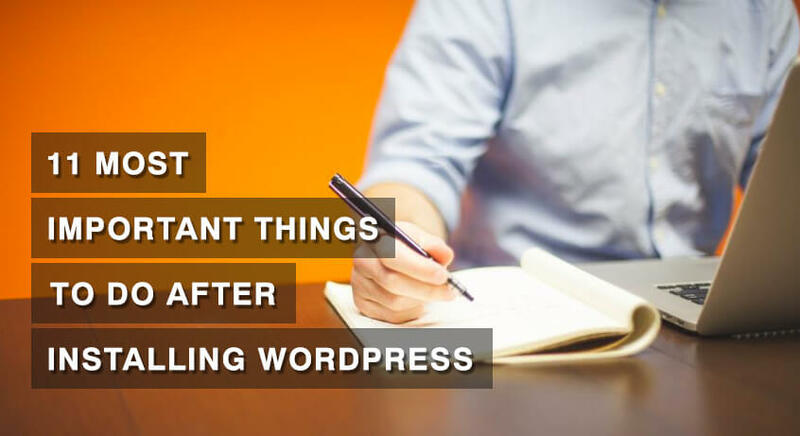 Astra is the perfect weapon for creating a free landing page website using WordPress. This responsive theme is light and minimal, yet fully customizable. Astra also comes with schema.org code integrated so search engines will love your site. If you are looking for a short and sweet website for your business, Astra is for you. Vantage is a neat and clean multi-purpose WordPress theme for businesses and agencies that want a professional looking landing page. 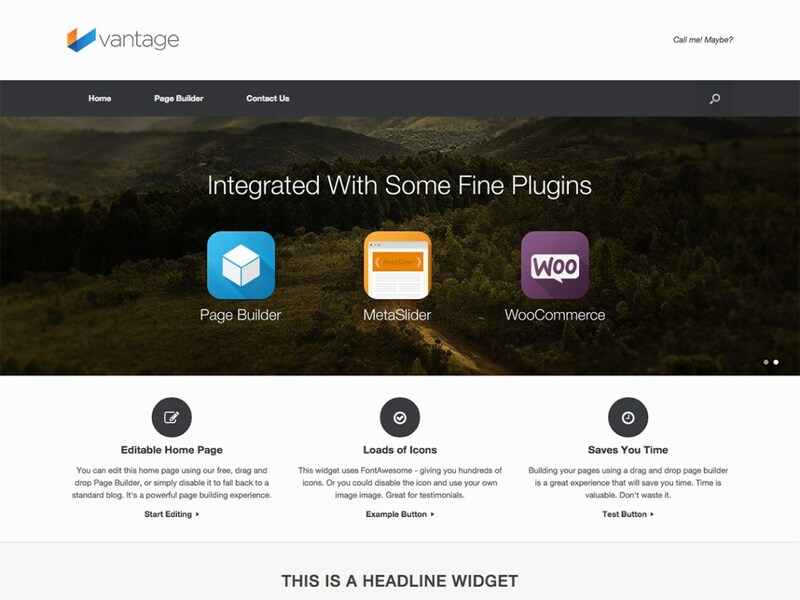 Vantage is one of SiteOrigin’s oldest and most refined themes. The theme works perfectly with SiteOrigin Page builder and is fully compatible with WooCommerce plugin. This free landing page theme is a perfect combination of modern responsive design with a classic feel. 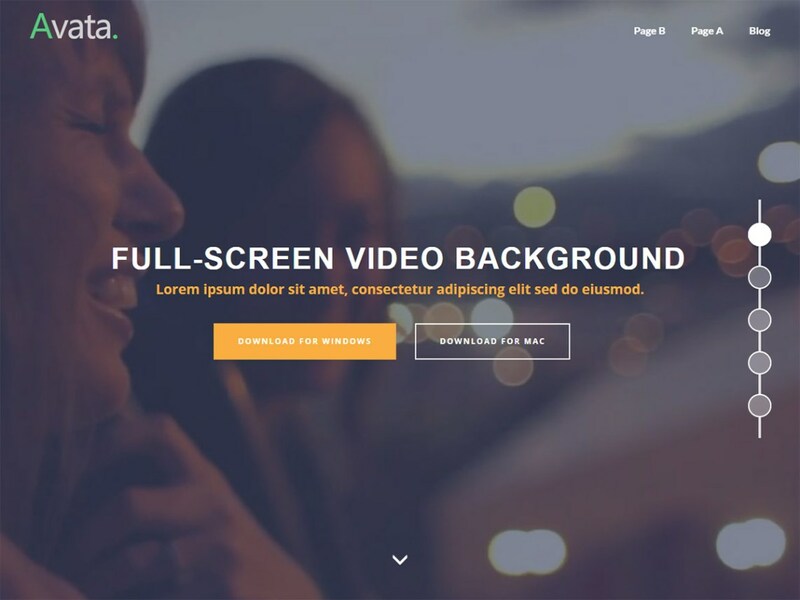 Avata is a stunning free landing page WordPress theme that comes with an advanced slider that supports full-screen video background. Based on Bootstrap and coded with HTML5 and CSS3, this free WordPress theme is fully responsive in desktops and mobile devices. Also, Avata theme is WooCommerce compatible, multilingual ready (WPML & Polylang) and translatable. Parallel is a complete solution for creating one-page landing page WordPress website at no cost. 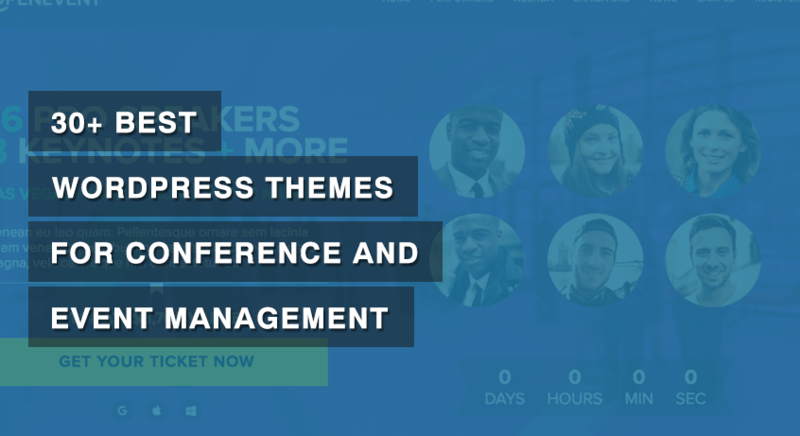 The theme is modern, professional, and has everything a business needs, from CTA buttons to pricing table, all on a single page. 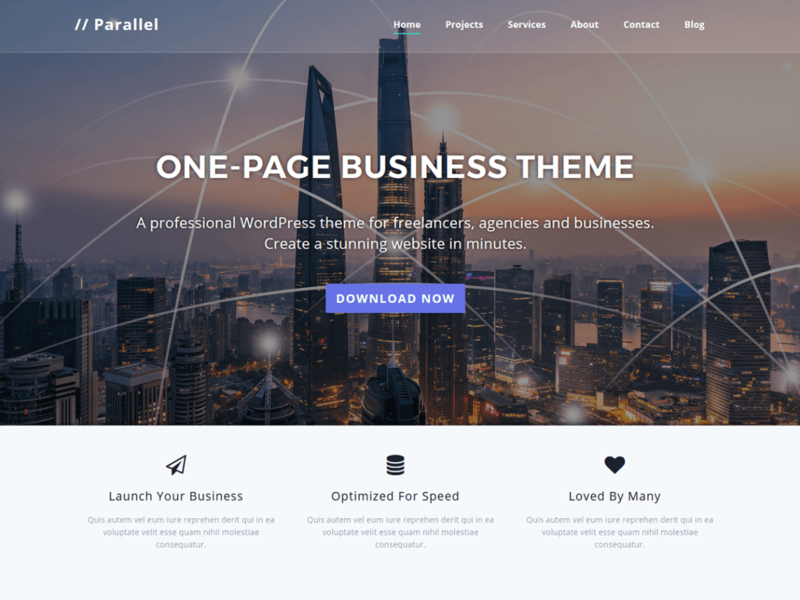 Parallel is an elegant business theme perfect for professionals and small business. A free theme too good to be true. 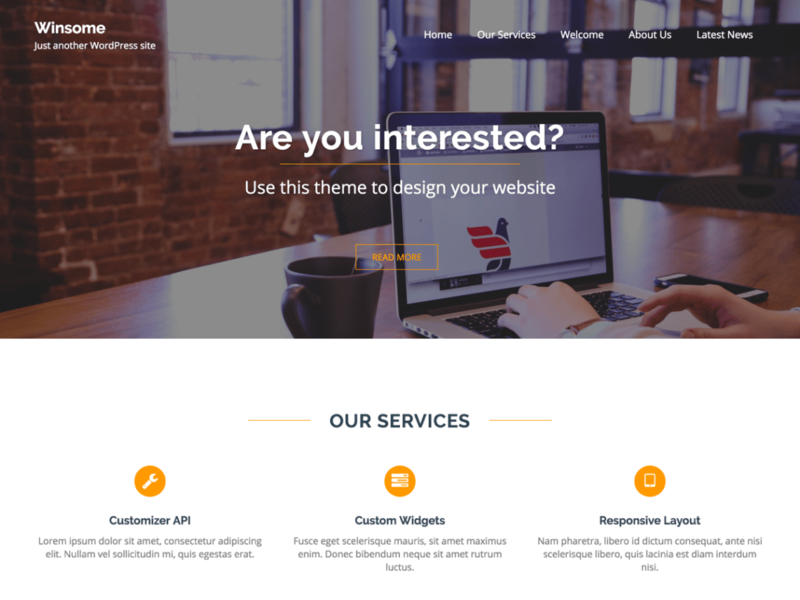 Somalite is a fully responsive free Bootstrap WordPress theme that can help you make a converting landing page for your business. The theme comes with 1-click demo import that can help you easily create a website. The theme is clean and has modern parallax effect. You can also create a complete online store with this theme using WooCommerce plugin. 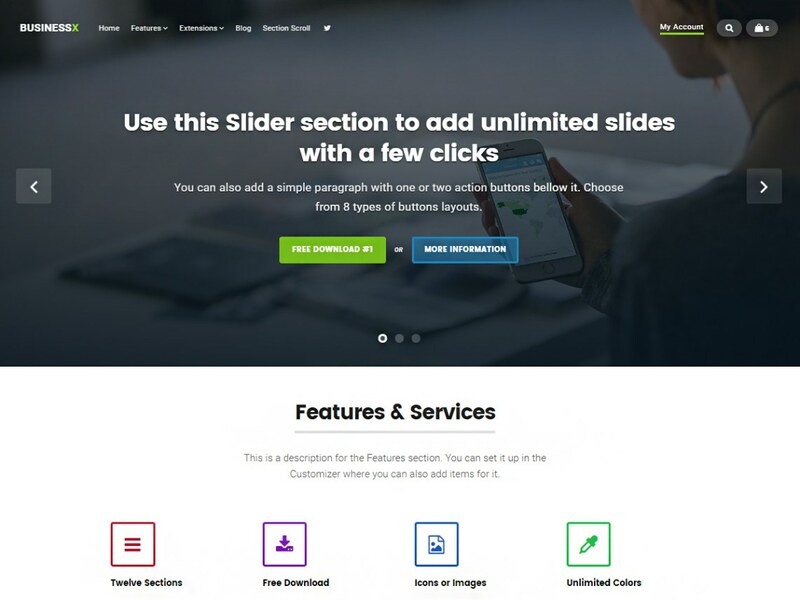 Screenr is a perfect free WordPress theme for landing pages. The theme starts with a full-width image with two CTA buttons and ends with a contact form so that your customers can ask any queries they have about your business. The theme is suited for business, portfolio, digital agency, product showcase, freelancers, and everyone else who appreciate good design. 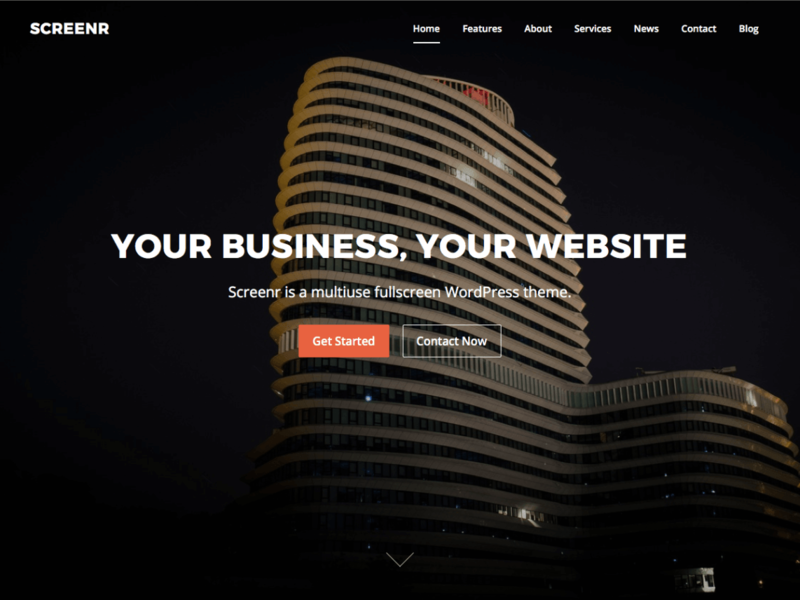 Businessx is a landing page WordPress theme for businesses and companies that want advanced and professional one-page website for free. The theme is compatible with WooCommerce and Polylang so you can also create an online store in multiple languages with this theme. 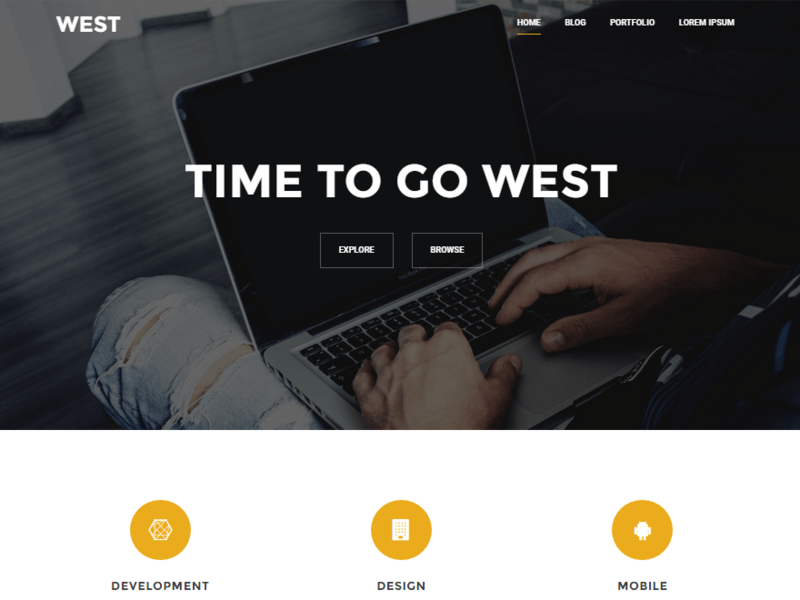 West is a free WordPress theme for creating a landing page for your company. The theme offers features like Live Composer integration, fonts and colors controls, blog options, custom header option, and much more.